As I mentioned before, we baked a lot during the Christmas break. I even forgot about my food diary…. How could I log in all the junk food that was consumed during the holiday season? 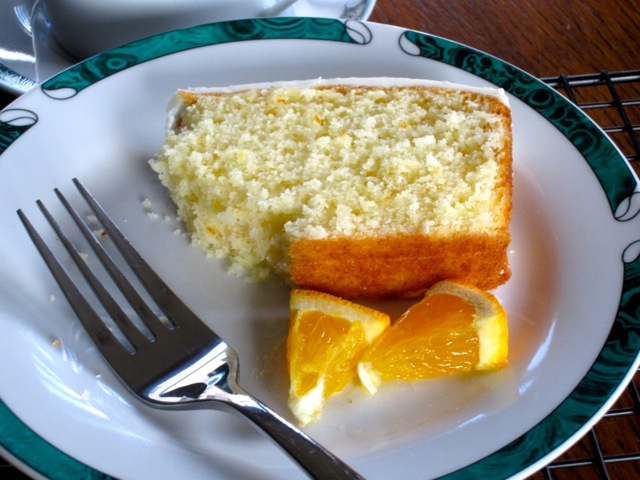 One of our favourites was the Coconut Orange cake. 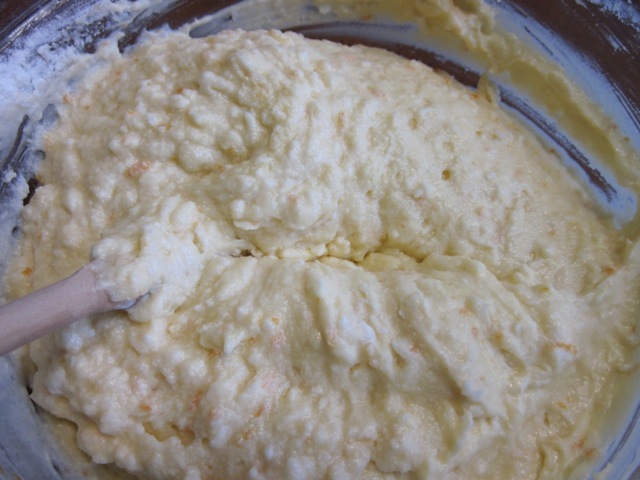 The main ingredients are desiccated or shredded coconut, orange zest (rind) and milk, besides the basic cake ingredients. For those who don’t consume milk, you can use coconut, rice or almond milk or soy beverage as a substitute. I haven’t tried them myself, but I’m sure they would work just fine. 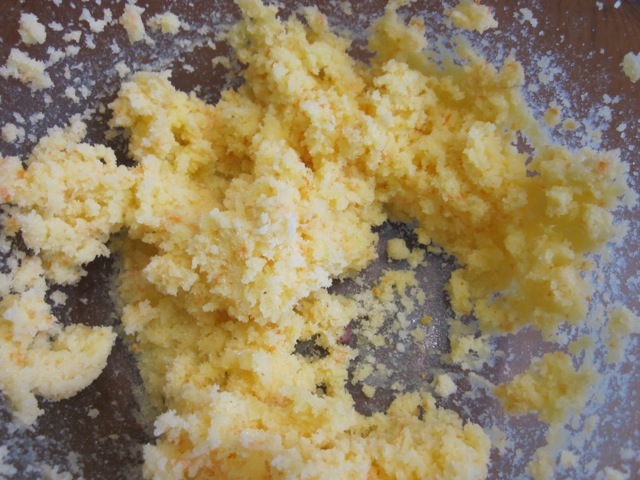 The orange zest can also be substituted with lime or lemon zest (rind). I actually prefer the taste and aroma of lime. It has a stronger taste and gives the cake a longer shelf life. 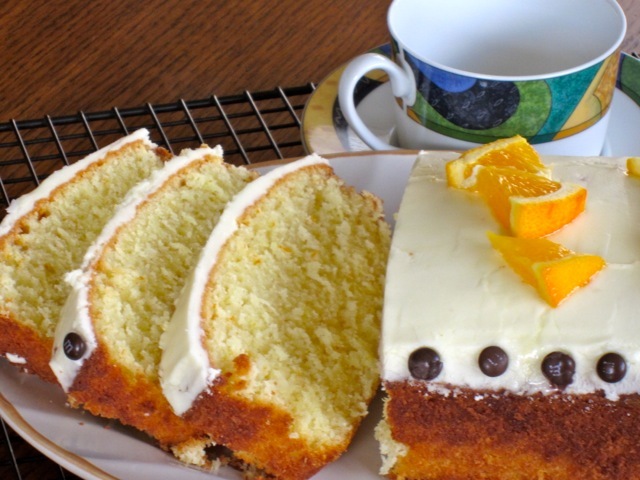 If you still feel energetic, after baking, you can top the cake with orange butter icing. We enjoyed eating this cake, and hope you do too. Combine coconut and milk and let stand at room temperature for one hour. Grease a 23 x 13cm (9 x 5 inch) loaf pan (tin) and line the base and sides with parchment (greaseproof) paper. 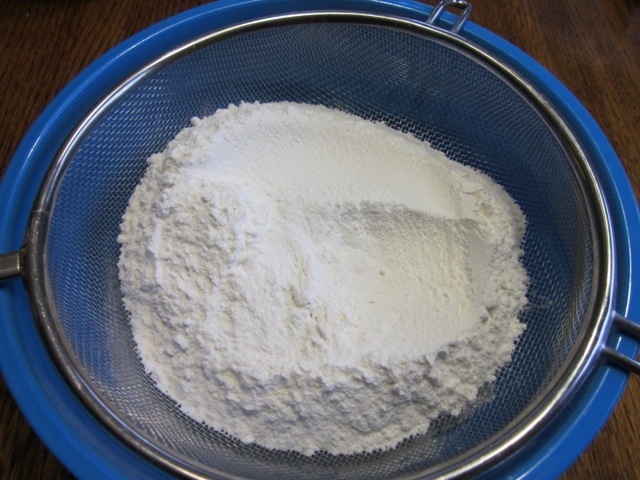 Sift the flour and baking powder. Set aside. Preheat the oven to 325°F (160°C) ten minutes before using. 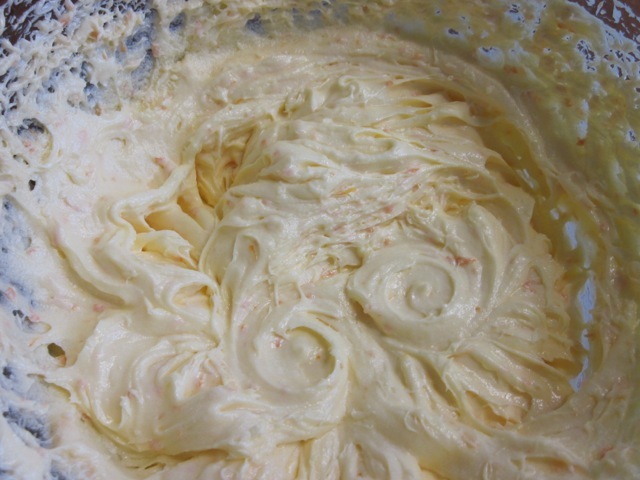 Beat butter, rind and sugar with electric mixer until light and fluffy. Beat in eggs one at a time, until combined. 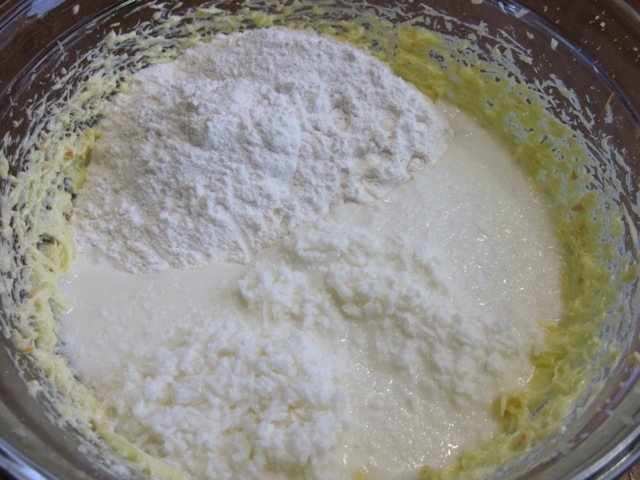 Fold in half the coconut mixture and half the flour, then fold in the remaining coconut mixture and flour, until combined. 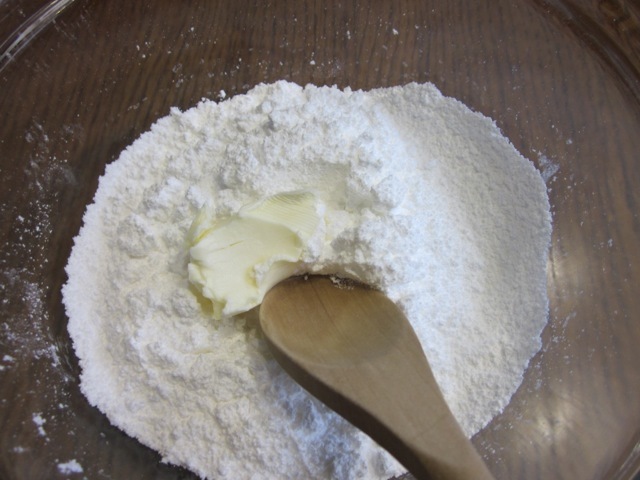 Spoon mixture into prepared pan and bake at for 1-1¼ hours or until a skewer inserted in the middle comes out clean. Stand 5 minutes, before transferring onto a wire rack to cool. 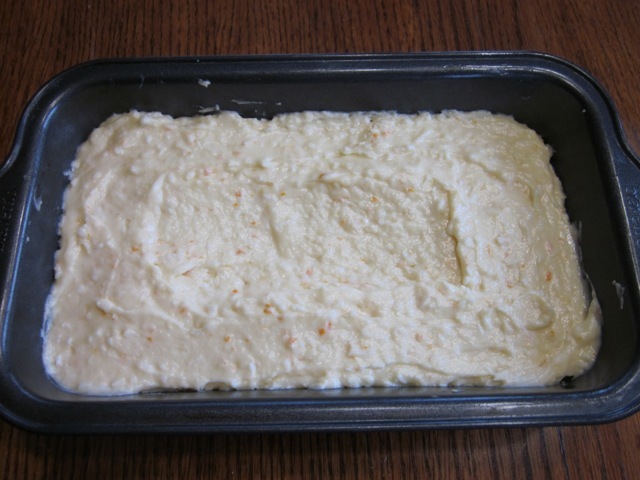 Spread cold cake with orange butter icing. Decorate with orange, if desired. Please note that oven temperatures are given as a guideline only. You may need to add or reduce the suggested temperature depending on your oven. 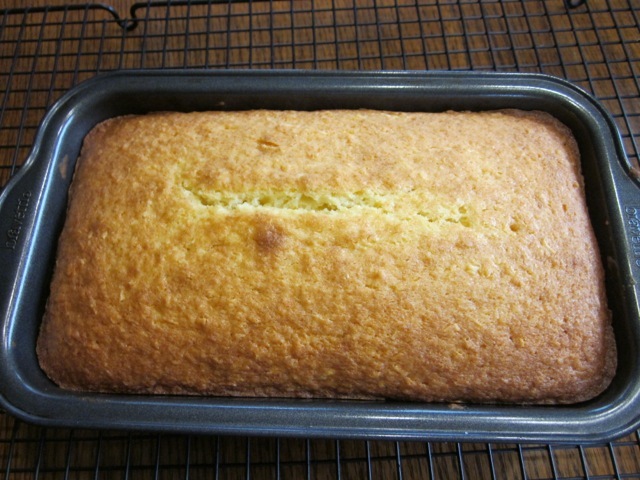 I baked the cake at 325°C (160°C) for 1 hour. Removing the cake from the tin was a bit of a challenge so I would strongly advice that you line the base and sides of the tin (pan) with parchment (greaseproof paper). Combine coconut and milk and let stand at room temperature for one hour. Grease a 13cm x 23cm (5” x 9”) loaf pan (tin) and line base and sides with parchment (greaseproof) paper. Combine butter, rind (zest) and sugar. 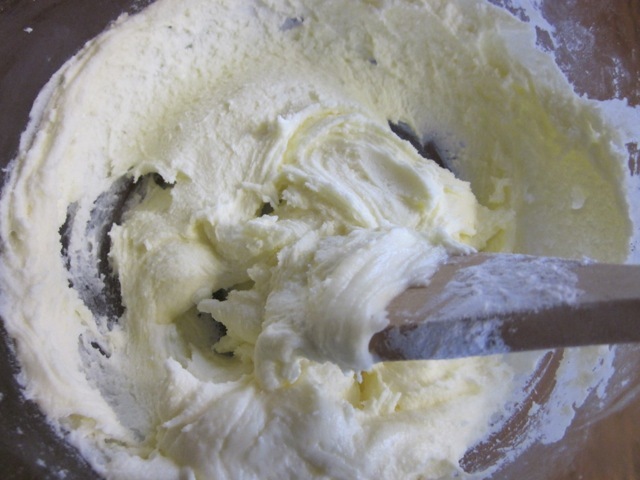 And beat with electric mixer until light and fluffy. 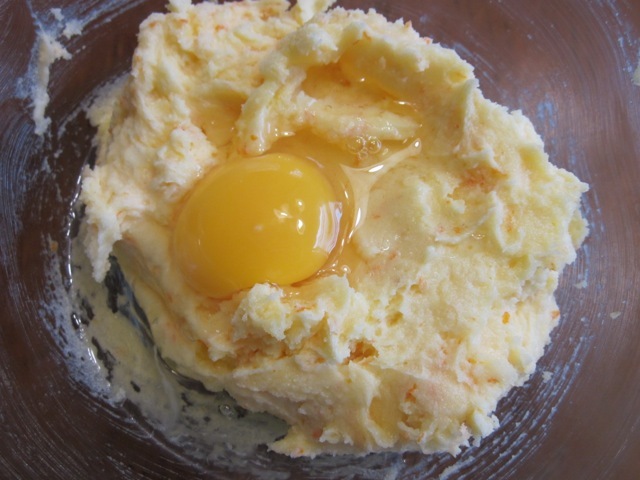 This is what the mixture looks like after beating in all the eggs. 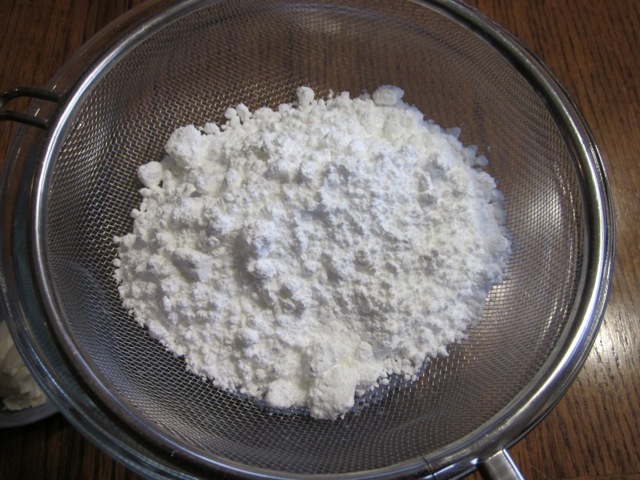 Fold in half the coconut mixture and half the flour, then fold in the remaining coconut mixture and flour, until combined. Spoon mixture into the prepared pan and bake at 325°F (160°C) for 1-1¼ hours or until a skewer inserted in the middle comes out clean. I baked for 1 hour. Stand 5 minutes, before transferring onto a wire rack to cool. 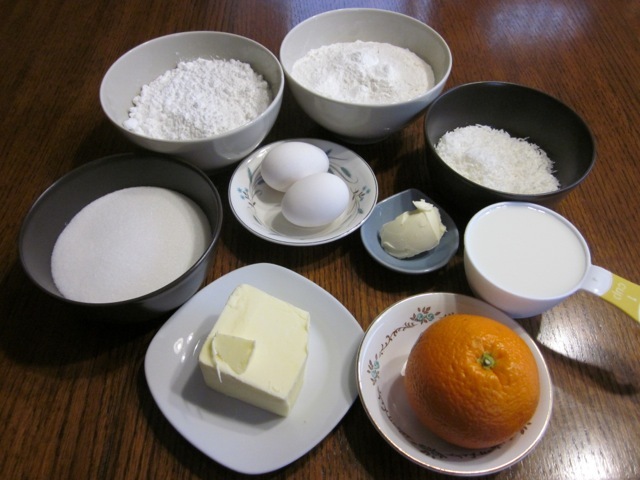 To prepare the orange butter icing: sift icing (confectioners) sugar into a bowl. 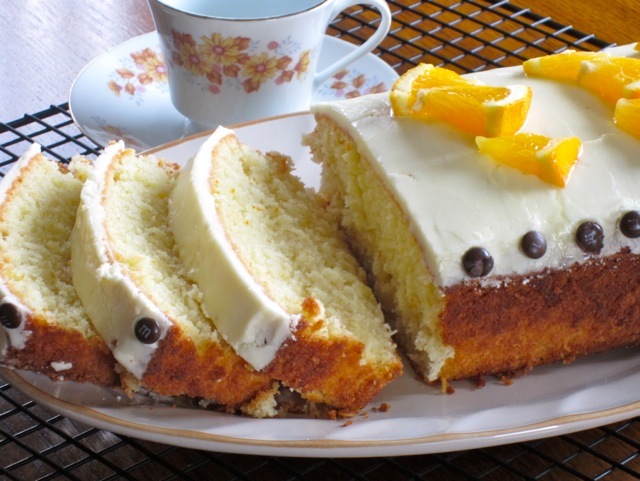 Spread the orange butter icing over the cooled cake and decorate with some oranges as desired. I have no words to describe it!!! Thank you Liz . Your cake looks amazing and i even tried your recipe! And it was delicious. My family really enjoyed. Im being asked to bake this delicious cake again. And i will have to increase the quantity. Question: Butter is really expensive at the moment where i live . Can i substitute butter with vegetable oil. Please advice. Thank you. Now it’s your turn to make it. Happy baking! Have a nice week, ahead! Thanks for re-following me and sorry I took a break from blogging. There are too many things going on right now and I can’t seem to find time for the blog. I hope you’re having a great time. Take good care of yourself, gal. Have a lovely weekend, ahead! As I like to say, often life interferes… A lot of bloggers end up taking breaks – it’s not just you my industrious friend. Right now I’m with two of my grandchildren in PA and I’ve been cooking a lot for them – and enjoying it very much. As you know, I do NOT like to cook for myself. I want to remake and photograph a really easy and delicious Rosemary Chicken, New Potatoes and Baby Carrots dish I made last night but didn’t have time to photograph. Tonight I’m making them a stuffed marinated pork loin… which I also won’t have time to photograph ’cause we’ve been eating around 4:20 in order to bring my granddaughter to gymnastics etc. (Heading from here to our Pocono house in a few days… it only takes about 1 1/2 hours to get there from here! (As opposed to about 4 1/2 when I leave from my house in Mass.) Hope all is well with you and yours my friend!! I’m glad to hear you’re still spending time with your grandkids and cooking too! Rosemary chicken with new potatoes sounds great. and stuffed marinated pork loin sounds even better. I haven’t been cooking new things of late. I need to get back into cooking mode asap. I’m missing out on a lot of things! I hope you enjoy your time in Pocono House. Have a wonderful weekend my friend and take good care of yourself and the grandkids! Hi, looks amazing! i’m feeling very lazy and don’t want to go to the shops-do you think i could substitute with coconut oil and orange extract? or should I at least get desiccated coconut? thanks! I would not recommend substituting desiccated coconut with coconut oil because the coconut gives it texture and the oil has not texture. 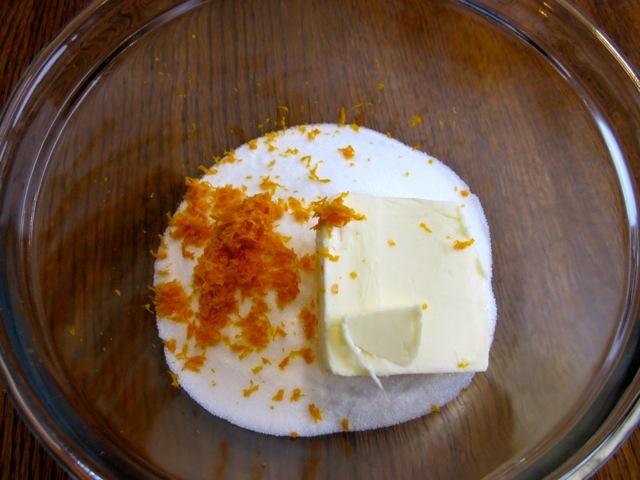 The orange zest can be substituted with extract. Yes you should at least get the desiccated coconut, thanks. Happy baking and thanks so much for visiting my blog. Have a lovely weekend, ahead! I made 2 versions of this, one vegan and according to the recipe, and for the first time ever the vegan version actually rose more than the one with eggs in it. I used NoEgg, but also added a good dollop of tahini which I think must have made the difference. Much of the magic of eggs is due to their proteins, so I added tahini to make up for the strange lack of protein in NoEgg. Thank you and have a fantastic week! Thank you. This is one of my most favourite cakes. You should try it! Not at all. Have a fabulous week! Oh gosh, I wish I was eating this right now! haha that cake is a keeper. I think I should bake it this week. Thanks for reminding me about it! Coconut and orange … STOP !!! ha ha you’ve cracked me up….thanks and have a fab weekend! Great tutorial, and the Desidarata, amazing…have a great day. Thank you, Fabiola. I love ‘Desiderata’ you too have a great week! Thank you for visiting – this cake looks yummy – I plan to try it! Happy trying. The cake is one of my favourites. Wish you all the best! This is making me crave cake (and I haven’t craved cake in a long time). I sometimes crave cake too! It’s nice to eat it once in a while…have a great week! Well, Miranda just informed me we should make your cake tomorrow. The orange will be removed from the freezer. I will put it in the microwave for a few seconds. The coconut is in the freezer, too. Guess what she wants for a frosting…ganache!!! Well, it’s off to the store I go for some cream. I have everything else. Did you make the cake? I am eager to hear how it went with ganache frosting. I can just visualize the cake with warm Ganache flowing over the top…it must be so delicious. Please keep me posted. Best wishes and enjoy Sunday!!! We didn’t get together yet but maybe today or tomorrow. Again, I must say that the ganache will only be made if the cake turns out. I REALLY do hate to waste product. AND, I will try to remember the photo!!! Okay I look forward to, whenever you find time and get together. Have a fantastic Sunday! I always keep my coconut in the freezer…and…an orange. Looks like it might be time to take them out!!! Does it taste good after the freezing? I think you should whip it out and make the orange cake. It’s arguably one of the best cakes I ever made. I loved it more than words can express. I wish you a lovely weekend! I’m into coconut these days and I know that I’d love this beautiful cake! Of course you’d love it. It tastes very nice. Have a fantastic week! Hey Mama D, thanks so much for trying out the recipe. I shall try a chocolate chip version, next time I make this cake. Enjoy the rest of the week! I could just eat a slice right now! Please help yourself to two slices. LOL. Have a lovely week! Thanks for your lovely comments. Have a lovely week! This looks so moist and light. I’m drooling. Have great day. Thank you, LIgnum. Have a nice weekend! I love this combination! I’ve baked with orange and coconut separately but never together. It’s time to give it a try! Your finished cake looks fabulous. Ha ha orange and coconut is a great combination. You should try it. Have a great weekend! I am gonna make this cake. What do you suggest in lieu of desiccated coconut? How was the cake Chef? I bet by now you already made it. What can you sub coconut with??? oats, bran, mixed dried fruit. Hope that helps? Have a great weekend! They do compliment so well, you should try. Have a wonderful weekend! How’z the New Year?…I would also love to bake with some pandan extract. Any idea where I can get some? Please let me know! There are pandan flavored treats everywhere. We grow pandan in our yards. If we run out, we simply ask some from the neighbor or we can buy them very cheaply. If we get too lazy to make our own pandan extract from fresh pandan leaves, we simply get a bottle of it in the baking store. I wonder what the Pandan flavoured treats taste like. Next time I’m in the baking aisle I’ll check it out. They are probably found in some speciality stores. Thanks, Hari. Have a wonderful week! This looks so rich and tasty! I must check this right away. Thanks for sharing the link! Enjoy your weekend. Thank you. please have a slice or two (LOL). Have a lovely weekend. This looks so delicious. 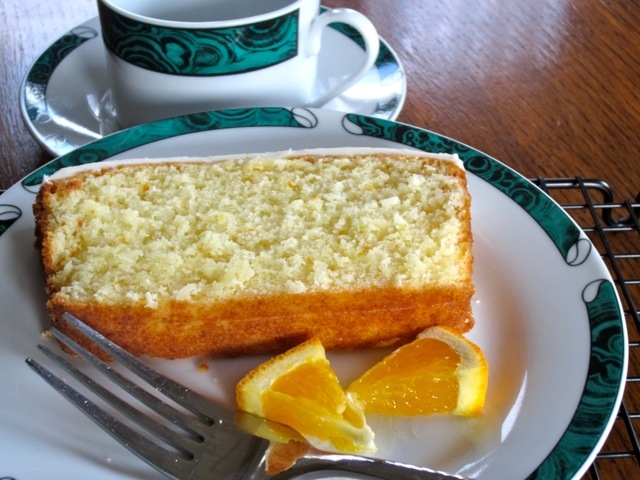 I love orange and coconut in a cake. Together it must be perfect! Coconut orange is a great combo. Thanks! Just got our chocolate version of this up on my blog. It was so incredibly tasty. Thanks for such a superb recipe! I am so happy to hear that it’s up and it turned out incredibly tasty. I am on my way to give it a glimpse. Thanks for trying out the recipe. I shall also try it with some chocolate chips next time. Will keep you posted. Thanks and have a lovely week! I wouldn’t normally put coconut and orange together, but it looks and sounds delicious! Ha ha you should try it. It’s delicious! Delightful – it really is the good word !!! It’s indeed delightful. Have a wonderful day! Aaaaah, I can inhale the smell and almost taste this yummy piece when I get really close to the screen. I have saved the recipe, i know it’s going to be a hit. Thank you so much for sharing. My second name is actually Dina, but I made it fancy and changed it to Diana. (the days of Princess Diana…). That is one of the best cakes I ate last year. I have to bake it again. I loved it. Have a wonderful week! Gorgeous as usual Liz. I am going to try making this and let you know. Thanks for complimenting and Happy Baking. Best wishes! 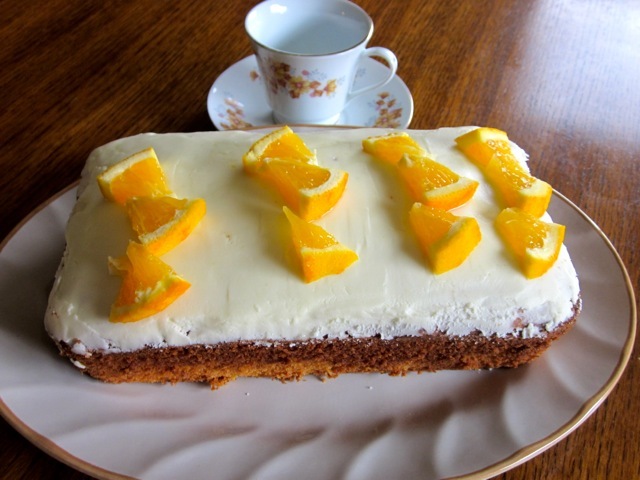 Orange and coconut – a winning combination! Your cake looks so refreshing – perfect for a post-Chinese New Year snack! I have been drooling over the ribs you made…I want to have them for lunch on Saturday. They look delicious. Have a wonderful week! Did you get my mail? I hope you loved it! No sorry i didn’t got any mail as such. resend it. Oh no, I meant the mail with the slice of cake (LOL). Have a lovely week! Hahaa…. oh yes i got your mail 😉 You too have a lovely week. Ooh love this flavour combo. Looks divine. Wow, you left me mouth watering again, Liz! I won’t forgive you for having let me see this recipe at this time of the day here in Spain (9:45 am). Ha ha you’re busy drooling over my recipe and I’m in the middle of dreamland, probably in my fourth phase of sleep. The cake tastes very nice. Have a lovely weekend! this is definitely going into the *must try* pile of recipes on my desk! Please give me a feedback. My to bake list is almost 1Km long. Happy Baking! Lovely combination of flavours – I like the idea of lime with coconut too. 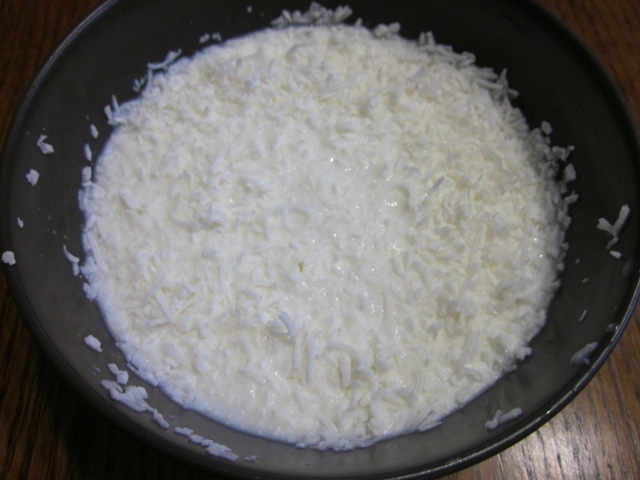 A great idea to soak the coconut in the milk – desiccated coconut can be soooo dry! Oh my! I am almost salivating looking at this cake! We are trying to eat really healthy and exercise….only trouble is a bad bronchial virus is laying us low right now. I don’t know when I’ve coughed so hard! One of us is now up and about and I’m feeling like I will be soon….one to go! We are in the land of coconuts and anyway they are supposed to be very healthy! I doubt it would take much arm twisting to get this on the table! I will try! Thanks Liz! Hope your week is going well? I’m so sorry to hear about the bronchial virus. My son was sick too but luckily he’s now feeling better. Please try and make the cake one day, when you have some time. Thanks Sandy for supporting me, always. Times get so busy sometimes-we’re having a BB tournament this weekend. We won our first game so far. Have a lovely weekend! I love the idea of coonut and orange together! I love that look of the icing on top! P.S., I’ve been weighing stuff more, when a recipe calls for it, and really liking the results. It makes me feel like I’m making something closer to what was intended. And it’s so true what you said about the oven temperature; I set mine at 300 when I want it to bake something that calls for 350! Thanks so much for liking that icing on top. I loved eating it. I love weighing because you always end up with the same quality and taste. I’m glad you agree. I always set my oven higher. I don’t have a very sophisticated oven. One of this fine days I should budget for a more modern one. Have a lovely weekend! Oranges AND coconut? Oh, my! Now DH is licking my iPad screen while we are eating our dessert – chocolate covered coconut and pecan haystacks! Oh yes, orange and coconut. Worth licking the screen for (LOL). You should serve this for the next dessert. Have a wonderful weekend!